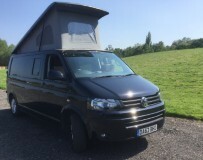 If you are looking to hire a camper and are in Surrey or visiting, Camperbug lists campervans in locations all over the county including Guildford, Croydon and Woking. On Camperbug owners advertise their beautiful campervans so that website visitors can pick and rent the perfect VW for their trip. I am Indy, hire me today! Stanley is a 1971 Early bay in blue and pastel white, fully restored can sleep 4 plus an infant in hammock over the cab. Scottie is a 1972 Volkswagen type2 camper that has been professionally and lovingly restored to better than new. Everything internally is new and designed to combine a practical modern camper experience with classic coolness. Hi Guys Volkswagon T4 Reimo Conversion, with extras. One of the most practical layouts but with added funk. The photos say nearly everything, it has a pretty neat sound system and is a great runner. You won't be disappointed.